There’s an old song – ‘It’s not how you start, it’s how you finish’. But it can’t be applied to Craigavon Borough Council who are finishing their life as they started back in 1973 - swathed in controversy. During the past 12 years or so, the council has followed a flags policy that seemed to be working as a compromise suitable to everyone - the designated days syndrome, fashioned in the early part of the millennium between the unionists and nationalists. DUP, as is their wont, made ‘anti’ noises at the time, and Sinn Fein weren’t all that happy. But it went through and it worked. That was during a short oasis of reason in Craigavon Borough Council’s history when SDLP were afforded the status of Mayor. Dolores Kelly and Ignatius Fox carried the position with dignity. Sinn Fein never made it. The closest they came was the last AGM when Catherine Seeley was made deputy mayor – and there has been plenty of fall-out from that appointment. Which takes us to the present hiatus with the council voting to fly the flag “365 days a year” over the Civic Centre, the punch line being that the council won’t be in existence for another 365 days – just 70 days from Monday night when the decision was made. Back in July, they set up an Equality Impact Assessment, with a view to flying the flag permanently over the Civic Centre, from civic buildings and in the town centres. The organisation Policy Arc Limited was tasked with the survey, at the considerable sum of £10,000. 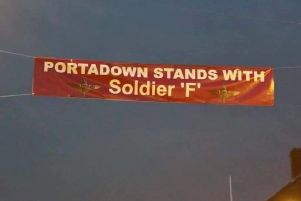 The Portadown Times questioned the wisdom of the move at the time, as we had been informed the findings would not be published until the New Year. That’s how it turned out, and the findings recommended the status quo. But the unionists refused to accept, they went for a ‘compromise’ to fly the Union Flag permanently at the Civic Centre only, which displeased those of a ‘green’ hue. More expensive legal action is threatened from Sinn Fein. It has always been thus with CBC. We have no intentions of raking over the annual Mayoral fiasco. But they are running true to form. Weary followers of the life and times of the council will recall the St Peter’s GAA affair when a dozen unionists were banned for five years and surcharged £100,000 after months of court action. And when the first two SF members were elected to the council, they were banished to a corner like naughty schoolboys until more legal action saw them sit around the main table, with the result that UUP and DUP pulled their chairs back to the wall. It isn’t clear whether the latest SF legal move will be completed in time for the change-over to ABC in April. But one thing is abundantly clear. The sectarian actions of Craigavon won’t wash with the more moderate Banbridge and Armagh members. Perhaps SF would be best advised to let this one pass, and let the flag flutter for the 10 weeks that remain. But they, too, have a Westminster election to fight – as do DUP and UUP who supported Monday’s night action. So we’ll sit back and watch the same old diatribe as Simpson, Dobson, Seeley and Kelly start their campaigns.